I have written on more than one occasion that I prefer animals to people for the most part. I always have, and I’m not sure it’s because animals are so wonderful or if human beings are so disappointing. Most likely it’s a little from column A, a little from column B. Liking animals so much (and coming from a family that also likes them) I’ve had pets for most of my life. They have always brought me great comfort and enjoyment and at times what feels like unconditional love, which may or may not be more about treats. If you have ever had pets, you are also aware of the major drawback: unless your pet is some sort of large tortoise, chances are it will not outlive you. Your life is marked through the years by the death of your beloved animals, and the more pets you have the shorter the time is between departures. If you’re lucky the end comes for a particular pet after a long life (long relative to whatever type of pet it was) and the pet goes easy and comfortably. That’s not always the case. Almost everyone had a cat or dog that got hit by a car. Every kid I ever met (me included) had a hamster or gerbil that disappeared, sometimes for good, sometimes turning up months later dried-up under the baseboard heater. I think the best pet dying story (and forgive me for seeming to make light of such a horrible subject, but it is funny) was the story of two brothers I know. When they were young, like most kids, they were obsessed with getting sea monkeys. In the ads they looked like little people, sometimes a male and a female wearing crowns, like they were king and queen of Atlantis. In reality, of course, they were brine shrimp, tiny flecks floating in the water a terrible let down. Well, it was the older brother’s birthday and he got the sea monkeys and both of them were quite excited to finally have them. They didn’t have a fishbowl, so they filled one of those big oversized novelty brandy snifters that someone you knew always had in the seventies with water and dumped in the packet of sea monkeys. The next day the sea monkeys were swimming around. They were still tiny, tiny enough to not yet crush the dreams of actual monkey-people as pets, so that night they went to bed still believing all the wonderful possibilities illustrated on the box. At that time, their father was quite the alcoholic, so while they were up in their beds sleeping, he arrived home very inebriated. Still wanting a drink, he spied the big brandy snifter and…well, you guessed it. He drank his son’s pets. Every last one. I wouldn’t even begin to try to figure out what kind of effect that would have on a child. It is not so tragic in the fact that pets that were consumed were only tiny brine shrimp whose part in the ecosystem is usually just that, to be eaten by something larger. It’s not like the guy ate their dog. But it must have left some scar on them. 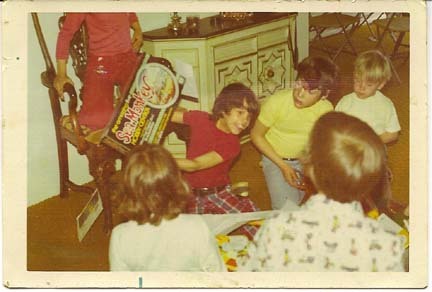 A few years ago they presented me with a picture they found of Mike at the birthday party holding up the sea monkey box and beaming so happily. I have it on my refrigerator and I’m actually touched that they gave it to me simply because I think it’s such a bizarre story and they know how much it fascinates me. On a side note: the younger brother, Dave, is obsessed with monkeys. He thinks about them all the time, he makes jokes about them constantly and he gives his girlfriend a stuffed monkey for every birthday, Christmas or Valentines Day. I don’t know if it’s connected, but I figured I’d mention it. Of course, the other option is the sad drive to the vets with a pet whose time has come. You know it from the minute you get in the car. Pets making that last trip always go wrapped in a towel on your lap. If you’re getting in the car and they aren’t in a pet carrier, you already know what the outcome is going to be. They are usually too weak to do much struggling and you spend that last trip telling them how good they are and how much you love them. I remember when I took my cat Harry on that last trip. I stayed with him while the vet did what he had to do and Harry slowly went limp as I pet him. We always take our animals back home and bury them, so I wrapped him up and the vet provided me with a box and I lay him in it. At that moment it struck me to remember that Harry’s mother, a stray we had taken in many years before named Mittens, had given birth to him and his siblings under my bed. Harry was the first out and Harry was a big cat, half Himalayan, and Mittens had screamed very loud while passing him. I picked Harry up right after that and set him in a box lined with towels. I was the first to touch him when he was born, and now here I was at the moment of his death putting him in another box. That circle of life moment hit me very hard and that’s when I really started crying. There have been countless others in my lifetime. There are other ways for pets to go. Our dog Angel went to have an operation and when they opened her up they found so much cancer in her that there was no point in finishing the surgery. We never got to say goodbye, and to this day my father does not handle pets operations well at all. I feel worse because the night before the operation I was going to stop over at my parents and bring her a McDonald’s cheeseburger and wish her luck on her operation. I had other things to do that night and I never made it, but I figured she would appreciate the burger after her operation more and figured no harm done. Then I found out she had gone and I wouldn’t be seeing her again and…well, I still haven’t gotten over that. Which brings me to today. I had to meet my parents at the vets today because it was our cat Pumpkins time to go for that last ride wrapped in his towel on my mothers lap. He came to us years ago as a stray and he had lived a hard life. He was a beat up, mangy thing, but he was still a very affectionate and loving cat. He may have been a streetwise tomcat, but he was such an old softy you had to wonder how he had managed to make it all those years outside. My fondest memory of him was five years ago when I had one of my fingers eaten by a bear. Yes, I know what I’ve just written, but that’s a story for another day. I spent a few days convalescing at my parents’ house on the couch. Pumpkin hardly left my side. When I awoke in the morning he was lying on the pillow next to me, watching over me and caring for me. I also used to love watching him play or even just walk around the house, because he did everything seemingly a beat slower than the world around him. Sometimes he reminded me of the old Bugs Bunny cartoons when they would break a bottle of ether and they would all move and talk so slowly. This morning his heart problem finally caught up with him and he wasn’t going to make it. At the vet they checked him over and any of the treatment options did not have much chance of working and would probably make the cats last few days a torment. Soon it was over for Pumpkin, and I couldn’t possibly go into any detail about it while it is still this fresh in my mind. I carried him out in the same towel he came there in and we took him to my parents’ house and buried him with the rest of the pets whose time had come while they lived there. And then my father and I went back to work. I was trying not to be sad and bitter, but it just seemed like a horrible part of life and made me question why it had to be that way. A few hours later my father and I went to the store with a friend of the family, a widow who was buying a new TV. We brought the TV from the store to her house and I set it up for her in her living room. Most of the goats were pygmies, but there was one big Billy-goat named Crybaby that was following us around and was in a playful mood. I was trying to pet the horses and he kept butting me and pushing me. Finally my father and I took turns grabbing his horns and engaging in a reverse tug of war to see if he could push us backwards. He could. I was laughing out loud at his antics as he would run a few steps towards me and then bolt off in the other direction prancing and jumping and happy to have made me nervous for a moment. He was, after all, a good sized goat with pretty big horns, but I knew he was just playing. So after that horrible morning putting my cat to sleep I found myself laughing and having fun with an ornery goat and the rest of them. Just that simply life was good again, and it reminded me that the reason it seems so sad at the end of our pets’ lives is because of just how good our lives are with them up until that point. I love this story. It makes me laugh and cry in a short span.